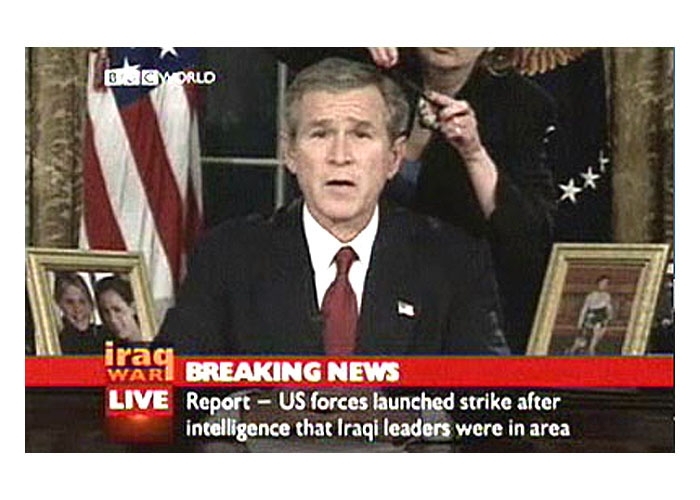 MARCH 21, 2003--The British Broadcasting Corporation has apologized to the White House for its broadcast Wednesday night of a live Oval Office feed showing President George W. Bush preparing for his speech announcing the start of the Iraqi war. 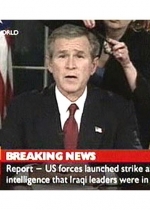 Administration officials are apparently steamed because Bush was seen having his hair primped and readied by a female stylist armed with a comb and hairspray. Below you'll find a screen grab from the BBC feed as well as a 10-second snippet from the unauthorized TV transmission.